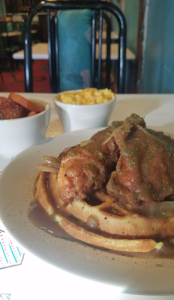 to SouthSide Bethlehem’s burgeoning restaurant scene. and empowerment series to the venue. 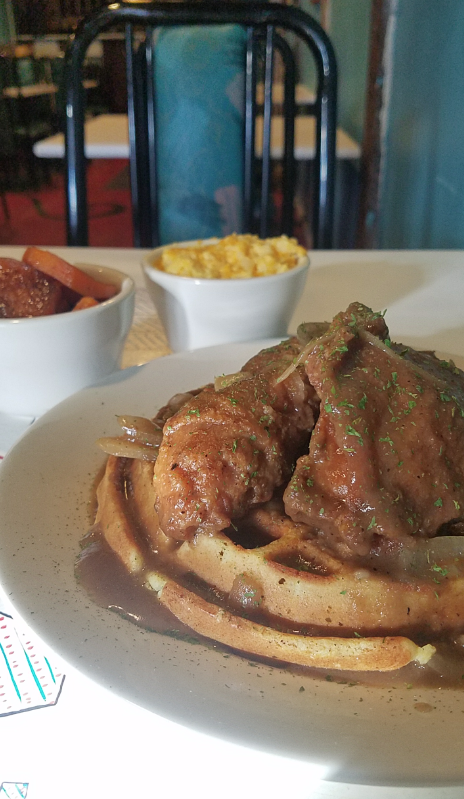 The scratch menu includes plenty of mouth-watering options, including the Smothered Chicken and Waffles topped with a gravy that combines both sweet and savory. The Smothered Black Bean meatloaf is a satisfying dinner that could probably even please a meat-eater with its hearty sauce and two sides. At .35 cents, ordering a side of cornbread is pretty much a given along with some candy yams. • Burns is an author too and you can find his book on the shelf upstairs in the library where guests can read and dine at the same time. • The lemonade iced tea has quickly become a customer favorite and is worth a sample with a good mellow balance of sweet and tart. 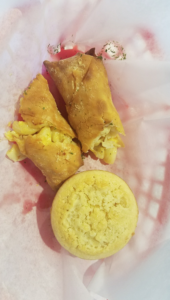 • The “Cak and Cheese” (cauliflower and cheese) might actually fool you into thinking it’s macaroni and not a healthy alternative. When ordering, shoot for: Something smothered, something honey-dipped and something Jerk — and don’t forget a Soul Roll and some cauliflower. Carribbean fare like Jerk chicken. one or two choices and didn’t include the signature flavors of the menu. At Hot Plate, you don’t have to feel shut out of any experiences by going meat-free with dishes like the BBQ Cauliflower, Jerk Cauliflower and Pineapple and Lemon Pepper Veggie Medley with homemade sauces. The owners have big plans for the second floor loft that they renovated, which include hosting local bands, family game nights and speaker series that focus on entrepreneurs and small businesses in the Lehigh Valley, all beginning in January. Previous post: Why isn’t my Business Listed in the Google Results for Best of the Valley?